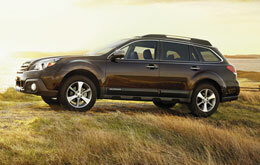 To begin reading Van Subaru's 2013 Outback review, scroll down below the video. How did Van Subaru manage to gather this information? By speaking to the most perfect automotive writers in the country. Loaded with important specs and information, each paragraph gives you complete access to all the Subaru Outback has to offer. Good luck on your Outback search! By examining the 2013 Subaru Outback head-to-head with the 2013 Toyota Venza, Hyundai Elantra Touring, Volvo XC70, Volkswagen Jetta SportWagen and the Chevrolet Equinox, and you can notice that the Outback transcends those autos in loads zones. Check out the hightlights below. Don't wander to a megacorp car repair shop in Kansas City when Van Subaru's phenomenal Outback experts are only a brief trip away from your household. We also supply a lengthy warranty on our work - more than most megacorp shops do. Van Subaru's competent mechanics will keep your Outback in athletic form. Whether you're on the hunt for cheap electronics repair or less laborious work like tire replacement or ordinary oil changes, we'll take care of it! And these things are only a portion of the work we do. As an added bonus you can look forward to honest prices on all work, as well as superior service every time you visit Van Subaru. Find out how much you can save on your next service! Just follow the link below.